Well, another Labor Day has come and gone, and summer is almost over, but that means that a new version of SOLIDWORKS is about to launch. It actually and officially launched earlier this week. This time around, SOLIDWORKS says its design-to-manufacturing process provides the tools needed to implement a comprehensive design-through-manufacturing strategy, all inside the SOLIDWORKS environment. These tools let you work without having to export and import data from one system to another. With IP embedded in the 3D design model, and at the center of the model-based definition (MBD) process,, and thanks to associativity, changes from design or manufacturing are automatically reflected in all related CAD models, CAM programs, drawings, and documentation. A couple of weeks ago, I attended a very interesting event called the 3D Collaboration & Interoperability Congress 2016 (3D CIC) that was hosted by our colleagues at Action Engineering. The actual conference event was two days, but was preceded by a SOLIDWORKS user group meeting that focused exclusively on model-based definition (MBD) for an entire day. Myself, along with about 60 other attendees got a good look at MBD, not just SOLIDWORKS’ perspective, but a broader view, as well. I was fortunate to sit next to Oboe Wu, product manager at SOLIDWORKS who is a huge proponent of MBD. With SOLIDWORKS MBD, you can communicate product and PMI directly in 3D, bypassing time-consuming 2D processes, in other words, drawings. SOLIDWORKS MBD sets data such as product models, dimensions, geometric tolerances, surface finishes, welding symbols, bills of material (BOM), callouts, tables, notes, Meta properties, and other annotations within the SOLIDWORKS 3D environment in 3D PMI. Because all the information needed to guide the operation is integrated with the 3D models, traditional 2D drawings are no longer needed (at least in theory). With MBD, 2D drawings become less necessary and meaningful. Instead of having a 3D model and a 2D drawing in a traditional workflow, the model is the drawing in an MBD workflow. The MBD approach provides a direct connection and single digital data thread from design to engineering to inspection. Interoperability, collaboration, inspection, quality, standards, proprietary data, neutrality, competition, and innovation – these are words and realities that all manufacturers deal with daily. Over the years there have been myriad attempts to bring this stuff together, all while protecting IP. However, as we know, while the attempts to make this happen have often been valiant, too often they have fallen well short, or worse, failed altogether. That failure may be on its way to being a thing of the past with the advent of the Quality Information Framework (QIF), an ANSI standard that supports digital thread concepts in engineering applications ranging from product design through manufacturing. Based on the XML standard, it contains a Library of XML Schema ensuring both data integrity and data interoperability in Model Based Enterprise (MBE) implementations. Of course, strides have been made for a way to communicate design engineering information in a paperless manner, but one of the most promising developments has been model-based definition (MBD) and model-based engineering/enterprise (MBE). We spoke with Aaron Kelly, SOLIDWORKS’ Vice President, User Experience & Product Portfolio Management about many things regarding the SOLIDWORKS 2015 portfolio launch, including a brand new offering called SOLIDWORKS MBD. It is designed to help improve communication between design and manufacturing teams by enabling them to communicate product and manufacturing information (PMI) in 3D. The intent here is to use Model Based Definition and to no longer use 2D drawings to define products. Over the course of a year I read a lot of books — technical, non-fiction, hardcopy, and digital. Most of them I get through, although there are some I don’t even try to finish, and a few become favorites and are kept for future reading on my bookshelf. I just finished a book entitled Re-Use Your CAD: The Model-Based Handbook by Jennifer Herron. When I saw Handbook in the title, I thought it would be just a dry reference book, but I was pleasantly surprised that it was much more than that — it’s a good learning resource. First, a little about the author and model-based engineering/model-based design (MBE/MBD). I’ve known Jennifer for several years as we’ve crossed paths at software conferences. She is the owner of Action Engineering, a company that specializes in the promotion, process development, and standardization of 3D CAD MBE and MBD. She is an expert in multiple CAD packages, which she uses along with her practical design experience to hone standards and processes that optimize the ROI of all CAD systems. She also offers model-based documentation education seminars, MIL-STD-31000A schema and modeling best practice training, as well as planning consulting services for Model-Based Engineering implementation. Keep in mind as you read the book that based on her experience, she is a stickler for standards, such as ISO, but you realize that’s probably a good thing. Her company is a consulting firm that transitions government organizations and companies to effectively and efficiently implement Model Based Engineering. With a specialty in training organizations to document and tailor their business practices to be compatible with CAD, PDM and PLM software tools, Action advises companies in: CAD modeling standards and best practice, designer modeling efficiency, CAD configuration management, MBE training, team collaboration and CAD interoperability. 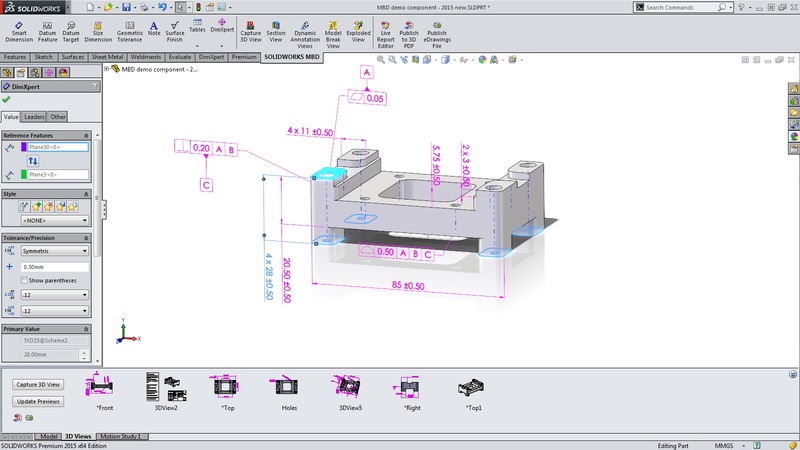 The concept(s) of MBE/MBD have received a lot of attention in the past few years because this approach handles product development using a digital master model, and not just necessarily CAD. All downstream activities can be derived from the master model to develop a product. The MBE/MBD approach replaces puzzling documents and can minimize the need for physical prototypes before an optimized design has been developed. In other words, engineers and designers can simulate and iterate as much as necessary to refine a model while also meeting requirements and adhering to design constraints. Now on to the book . . . The book is structured in a logical manner for those both new and experienced with MBE/MBD. Throughout, it stresses the importance of standardizing, centralizing, documenting, and reusing a CAD database. It’s written in a CAD-agnostic manner, so its principles can be applied in any CAD environment, regardless of vendor.